joy and success in your life today! Why wa it years for the life you want - begin creating your joy and success now! Just take a look around you and you readily see the abundance in nature - the twinkling stars in our vast universe, the incredible roar of the ocean, and the infinite grains of sand on the beach. Beauty, love, joy, peace, success, health are all part of our journey. It's possible...and probable for us experience a life of joy and abundance. You may be seeking a different career path, a loving relationship, less stress in your life, or greater joy and peace in your life. Fear, stress, old negative programming, negative energy, and unhealty or toxic relationships and environments may be taxing your self confidence and hindering your ability to garner the abundance and joy you deserve in life. Take a chance on your happiness and success - it's practically a sure bet! With the right tools and guidance, you can plant the seeds to create the life you desire and change a life of anxiety, stress and disappointment to a life of greater peace, hope and anticipation of what wonderful things you now invite and allow into your life. When you refocus your energy, reclaim your power, and work to change old belief patterns holding you back from reaching your potential and living the life you desire, you will make great strides toward your success, joy and abundance. My first and celebrated creation, The Divine Declaration: Awaken to Your Divine Inner Power, Your Life Depends On It is a synthesis of 20 years of my own spiritual and personal growth study and experience. It is a foundational step on your path leading on the journey to the life you desire. An indispensable, accessible knowledge of how to recognize divine inner power and why it is so important. The Divine Declaration: Awaken Your Divine Inner Power Your Life Depends On It by W. Jane Robinson introduces the process of directly engaging our divine inheritance and inner powers. Expertly guiding readers through a conceptual and comprehensive understanding of the complex workings of a complete self-discovery, The Divine Declaration offers an indispensable, accessible knowledge of how to recognize divine inner power and why it is so important; what might restrain such powers; how to find purpose in life and in dreams; how to change thoughts and life; techniques to help the expansion, growth and strength of our inner power, and so much more. The Divine Declaration is very strongly recommended for all who are searching for a "user-friendly" instructive guide to developing their life's most productive and insightful progression through accessing their own inner resources. Everyone is seeking divine inner power. We hope and pray that we wake up one day and figure out how to tap into the incredible energy and life forces we know are inside us and all around us. Jane Robinson knows from her own experience that spiritual energy is in and around everything and is also the power inside us awaiting our awakening. In spite of the adversity she faced growing up in the foster care system, she tapped into her own emotional power and freedom. This connection changed her life and she teaches us how to open this connection within and understand that without a definitive declaration for the direction in our lives we often make life choices by default and create consequences that are not what we really desire. With chapters in affirmative prayer, meditation, treasure mapping and creative visualization, The Divine Declaration shows how to live authentically and allow the Universe to support and direct our life. "Many books have been written about the divinity inherent in all of us, but few ever move us to take practical steps to awaken or discover that divinity. The Divine Declaration is one of those rare books that doesn't only tell you why, but actually shows you how to free yourself from limiting beliefs and things that have held you back. Not only does the author guide you, she does it with simplicity, power and elegance. Read this book and follow the guidance and you'll find your life evolving into a glorious adventure of joy, peace, prosperity and all good things." fresh air. I even found things in this book that help me. So I thank you, Jane Robinson, for writing this!" Jane co-authored this book with Zig Ziglar, Brian Tracy, Denis Waitley and 98 other experts on how to improve your life. 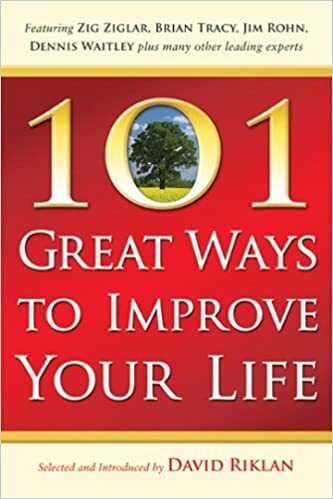 101 Great Ways to Improve Your Life is a collection of columns written by experts written especially for your success.